Thurgarton Open Air School or The Home for Recovery of Phthisical Children of School Age at Thurgarton. 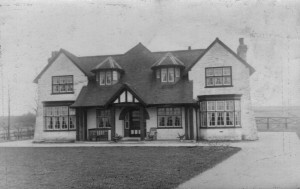 The Whitehouse in Thurgarton was a purpose built house for children recovering from tuberculosis. It was opened on St. George’s Day 1910; at the ceremony (see photograph below) were the leading lights of the local founding committee – Mrs Upton of Thurgarton Priory, Bishop Hoskyns of Southwell (in top hat) and the vicar of Thurgarton, Rev. Atwell Baylay (with beard). The boy on crutches is Fred Warrener whose brother Percy lived for many years in the cottage on Bleasby Rd. now called Warrener’s Cottage. 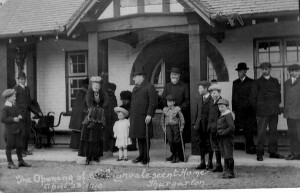 Opening ceremony of the Whitehouse, Thurgarton on 23rd April, 1910. The home was closed soon after the outbreak of World War 1. It reopened on July1916 when the Nottingham Voluntary Care Committee bought the house and installed a matron and assistant to look after several children from the city who suffered from pulmonary tuberculosis. In August 1916 Dr Philip Boobyer, M O for Nottingham City backed the scheme and in September the City Health Committee voted to take over the running of the home as part of their anti-TB scheme. In the first decade of the 20th century many boarding schools for consumptive children were built; these open air schools had been popular in Germany for several decades but Britain had been slow to adopt the practice. On 23rd September1916 Dr Boobyer and Dr. Muriel Bywaters met for an inspection of the Thurgarton house. Muriel Bywaters from the Board of Education in Whitehall spent many years travelling the length of England as the government’s chief inspector of schools for tuberculous children. Her report describes the house as standing on the edge of the village in ¾ acre of land amidst open fields. The ground floor consisted of a dining room, matron’s sitting room, kitchen, pantry, a corridor with pegs for coats and hats, and a single lavatory with a wash basin. On the first floor were matron’s bedroom, two dormitories with room for 4 and 5 beds, a servant’s room and a bathroom with one bath and two toilets. Lighting was by candles there being no electricity or gas supply and no telephone. Water was obtained from a 60ft. well with a pump in an outside washhouse. Dr. Bywaters made several recommendations: an outdoor classroom, larger windows and better ventilation, more toilets and a better bathroom. These alterations were designed to ensure sunlight and fresh air for the children and were essential to the ‘open air’ treatment of tuberculosis. The open air approach to tuberculosis was based on a belief in the recuperative powers of a prolonged regime of as much exposure to fresh air and sunlight as possible, an abundant diet, freedom from all excitement with repose of mind as well as body and regulated exercise . The staff, which consisted of a matron, an assistant, a cleaner and gardener, cared for 4 boys and 5 girls aged 6 to 11 years all suffering from early pulmonary tuberculosis. The matron, Miss Stebbings, had herself only recently recovered from tuberculosis having spent 6 months in a sanatorium. Dr Bywaters was concerned by her persistent cough, husky voice and frailness and doubted her physical fitness to cope. The children’s daily routine included long periods of rest with bedtime from 6.30pm till 8.00 am. School lessons extended from 9.30 am to 12.30 followed by light exercise in the afternoon. They were bathed twice a week and weighed once a week. Dr Bywaters was very concerned that the older boys were mixing with the girls and recommended that the home should be exclusively for girls. An open air garden shed/classroom was built in March 1917 and a new teacher appointed to teach the 3 boys and 7 girls now living at the home. There was evidently a problem in keeping ladies in this post which paid £50 with free board and lodging – the succession of incumbents included Miss Sarah Parkin in 1917, Miss Freda Barnard in 1918 and Miss Beatrice Neate in 1919. The children’s education was a problem mainly because the teacher had to spend most of her day on nursing duties and had little time for lessons; Miss Neate wrote a letter complaining that she could only “play at teaching” and left shortly afterwards to be replaced by a Miss Florence Sharpe. 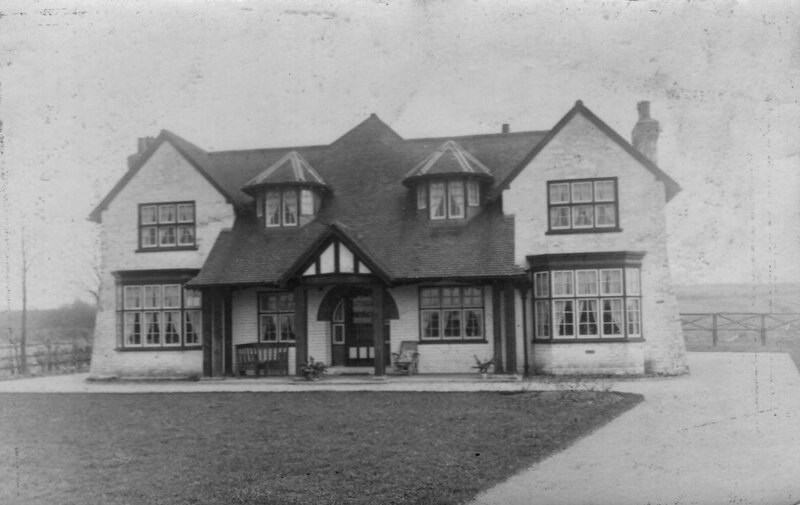 In 1919 Nottingham City started to convert Bulwell Hall into a large children’s sanatorium/school and in October 1920 the Thurgarton home was closed and the children transferred to Bulwell Open Air School. Work on Bulwell Hall was still in progress and in March 1921 an inspection by the ever vigilant Dr Bywaters found awful conditions – 40 children living in dirty rooms, inadequate toilets, poor furniture and thin blankets. The standard of teaching was poor and one teacher had active tuberculosis and was unfit for duty. A repeat visit late in 1921 fortunately found vast improvements at Bulwell and a much happier home for the children. The Hall changed use to an approved school for boys in 1937 but at the outbreak of World War 2 was used firstly by local regiments and later as a camp for Italian prisoners. It was finally demolished in 1958 but the surrounding estate survives as Bulwell Wood Park. The Whitehouse at Thurgarton survived – it was converted to a private dwelling and still stands on the north-eastern edge of the village. National Archives ED 32/173 notes from Nottingham Corporation on Thurgarton Open Air School 1916-1921.
http://www.nottsheritagegateway.org.uk/people/moh.htm a brief biography of Dr. Boobbyer. http://www.jstor.org/pss/25430195 obituary of Dr. Bywaters in B.M.J. Dec.1978 who died at the age of 95.
http://www.faqs.org/childhood/Me-Pa/Open-Air-School-Movement.html – notes on open air schools in Britain. Very interesting about the sanitarium. Do you know its exact location other than “on the edge of the village in open fields”? Was it toward Southwell or the opposite direction. The photos are very interesting. The article seems well researched and it must have been difficult to find the photos. Rod Thanks for the kind comments – the convalescent home is still called the Whitehouse and is the last house on the left on the main road going towards Southwell.